The thieves nabbed the consoles from a warehouse in Seattle, Washington. Update: Seattle police reported today that they have found two trucks involved in the theft of these Nintendo consoles. Police found the smaller box truck in the nearby municipality of Fife, Washington, with the commercial logos removed, and a semi truck in Auburn with the vehicle identification number covered up and a new company name "S.S. Trans" painted on the sides. But while some of the evidence of the theft was recovered, police are no closer to finding the 7,000 consoles stolen. They are still hot on the chase. "SeaTac detectives are working with the Los Angeles based Cargo Theft Task Force on the case," said a police spokesperson. "Detectives said that the reward in the case has also been increased to $10,000 thanks to donations from private businesses." I don't know if 10 grand will make up for the $2.45 million the merchandise is worth, but we'll see if any good Samaritan comes forth with information. Also, the police reports specifically mention the Nintendo "Wii" with no indication of a "Wii U" so it's unclear what the exact value of the theft actually is. Original post: We've heard of a few high-profile heists in the last six months. There were the two walnut robberies committed by an unknown man with a Russian accent, and the Goodfellas-styled pilferage of 3,600 iPad Minis. But neither of those capers will hit the gaming community more than the report today that thieves somehow made off with 7,000 Wii Us from a warehouse at Seatac Airport. According to the police, the crooks drove two diesel semi truck cabs to the warehouse around 9pm Saturday night and backed them up to trailers already at the warehouse. They loaded 64 pallets of boxes containing Wii Us using the forklifts in the facility, and stole an official airport box truck to get the last of their load. The police are stumped, and have turned to the public to learn if they have any tips as to where these consoles might be. "I've been a cop for 28 years, and I've never seen anything like this," said Sgt. Cindy West. "This has come straight out of the movies." 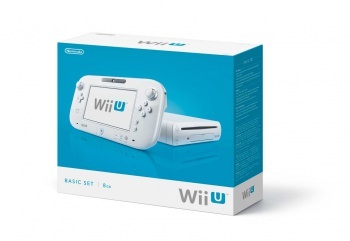 What's not clear is whether the Wii U stolen were black Deluxe versions, the Basic kit, or a mixture. The Deluxe package retails for $350, so it's possible the thieves made off with $2.45 million worth of merchandise. Police are searching for two white trucks with a trailer marked with the word "McKinney" and a box truck with "Seattle Air Cargo" on the door. "If we don't get any tips ahead of time, it will be the selling of these consoles that will lead to their capture," she continued. "It's gonna be pretty hard to hide 7,000 Wii game consoles." In other words, if these consoles start showing up being sold out of the back of a Lincoln in mall parking lots across the country, we might have something to go on. Nintendo might even have some way of tracking these devices, especially if they start trying to access the internet. There's no word on how this will affect supplies of Wii Us in legitimate retail stores this holiday season. Some the stolen consoles may have been destined to be in the hands of a kid next Tuesday, and that means we'll have 7,000 less videos like this to share this Christmas. That's sad ... I think.